« Save up to 20% on Premium Rooms at Disneyland Hotels This Fall! From cooking demos and live music to delicious food and wine, there are so many reasons for you to experience this year’s Epcot® International Food & Wine Festival at Walt Disney World® Resort! 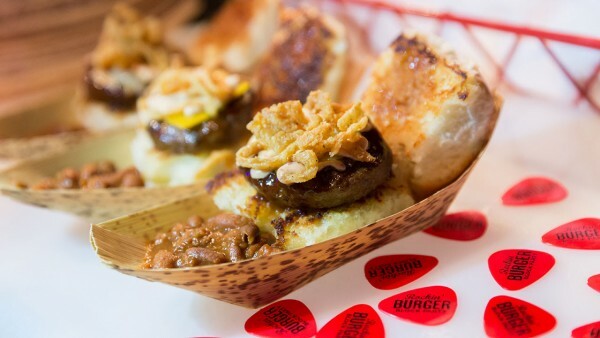 Let’s take a closer look at one of those tempting opportunities – the Rockin’ Burger Block Party. These are just two of seven impressive burgers at the first party on Sept. 30, 2016. Other parties will take place on Oct. 14 and Nov. 11 where all-new creations will be featured, with music and plenty of libations adding to the fun. You can even vote for your favorite burger! Check out all the top reasons for you to visit the Epcot International Food & Wine Festival Sept. 14-Nov. 14, 2016 in this video! Do you want to make amazing memories at Walt Disney World? This entry was posted on September 13, 2016 at 3:47 pm and is filed under Disney Dining, Disney News, Disney Vacation Planning, Epcot, Food & Wine Festival, Walt Disney World. You can follow any responses to this entry through the RSS 2.0 feed. You can leave a response or trackback from your own site.